Our wine tasting evenings and one day wine courses are available in Cardiff, at the Jurys Inn hotel, centrally located at Park Place in the heart of the city. We have a regular diary of tastings for you to come along to which are educational yet fun and sociable. Check out forthcoming dates listed below or if booking for a large group and there aren't any suitable dates, do get in touch. 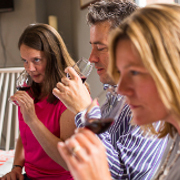 Join us for a relaxing evening or day out, learning the key points about wine and wine tasting. We have Wine Tasting Evenings that you can attend mid-week and we are running our popular One Day Wine Course on Saturdays including lunch and 16 wines to taste. Perfect as a gift for anyone who's into wine or as a treat for yourself if you are keen to learn more. Whichever session you choose, you'll benefit from our educational yet fun approach and enjoy spending time in the company of like-minded wine drinkers. If you are buying this as a gift experience you can purchase an open-dated gift voucher so that the date can be booked with us after your gift has been received. The voucher will be emailed to you automatically as soon as you have completed your purchase or we have printed gift vouchers that we can post to you or the gift recipient for £2 (select at checkout). We can host any of our wine tasting events for private groups of 10 people or more or corporate wine tastings at various venues in Cardiff. Not found what you are looking for? Register your interest in attending a wine tasting event in Cardiff by completing the form below.